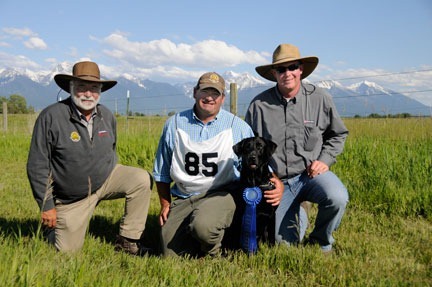 New NAFC, FC-AFC Cody Cut a Lean Grade, “Grady,” owned and handled by Chad Baker, won the 2011 National Amateur Retriever Championship which concluded June 25 in Ronan, Montana. Grady has had multiple incidents of grass awn infection, with treatment requiring major surgery. Not even grass awn infection can keep a great dog down. Congratulations as well to another grass awn survivor, Finalist FC-AFC Trumarc’s L’il Ms Pogo, owned by Martha and John Russell and handled by Martha. Pogo lost two lung lobes to a grass awn infection two years ago, and recovered to contend strongly for the NARC title thanks to Martha’s nursing skills and dedication to her recovery. For great detail on the event, check out the Retriever Report and Retriever Blog courtesy of Retriever News, http://2011narcreport.theretrievernews.com/ and http://2011narcblog.theretrievernews.com/. This entry was posted in Grass Awn Project. Bookmark the permalink. One Response to Congratulations, Grady! How long can if take for his infection to show up?